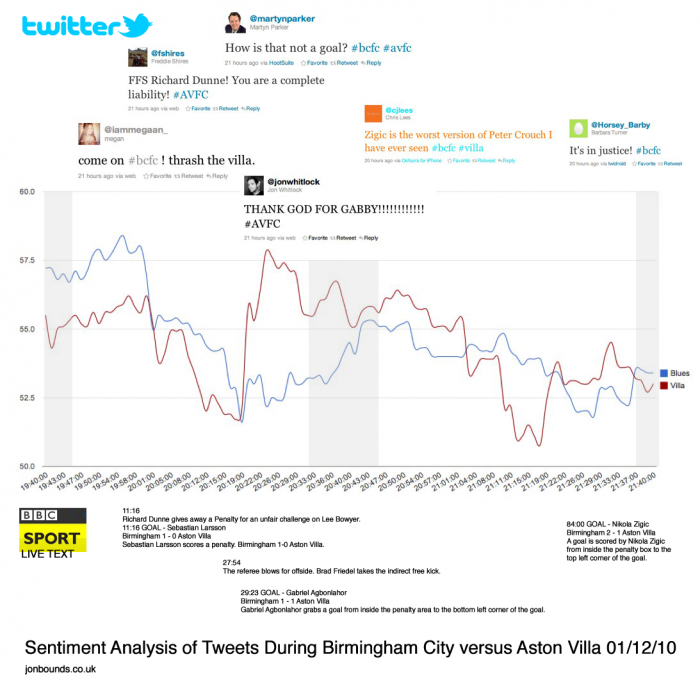 Last night I turned my sentiment analysis tool on two hashtags: #bcfc and #avfc, the most widely used tags to refer to Birmingham City and Aston Villa during their League Cup quarter final game. 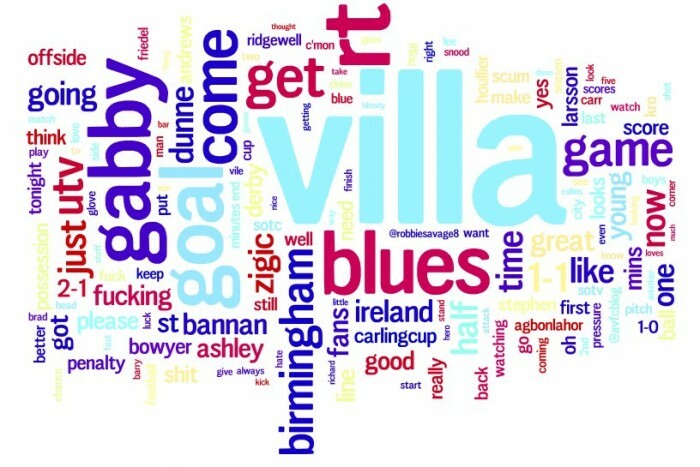 It was a chance to see if visualising to ‘competing’ tags around the same event would be a useful exercise. Some people use the tags instead of team names, meaning that they might be used by people supporting the other team (or no team at all)—most fans, though seem to tag with just the hashtag representing their team. Some tweeters use both—these tweets could be removed technically, but make no difference to the comparative scores. If there’s a subject that uses more slang or metaphor than football, it’s not often discussed on Twitter. There was a generally a downward trend throughout the match, tension? Bad football? It could have been both. The first two goals seemed to have a much bigger impact than the third—this I don’t quite understand, but it seems to be more about the tweets themselves than the tool. I could see how a special subject-set of emotion words could be created for football, which could cope with more nuanced or unusual words. It’s something to consider. The sentiment scores in a Google spreadsheet, csv files: #avfc tweets (657 of which were during the game), #bcfc tweets (370 during).